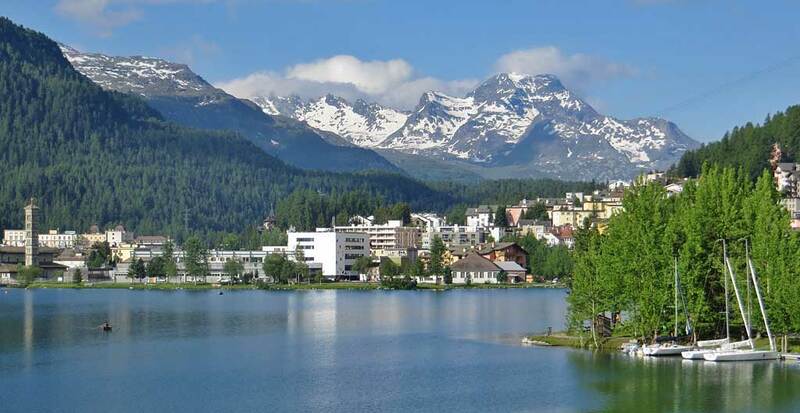 We started our Switzerland Train Trip from Salzburg on a 7 hour train ride to St Moritz. The rainy June weather continued, but it was mainly overcast and the bottom half of the peaks were visible. The Austrian train to Chur, Switzerland ran at a very high speed and it was quiet and comfortable. The free onboard Wifi allowed me to reconcile my credit card statement, check bank balances and update my travel budget while admiring the Alps at the same time. Only an accountant can truly appreciate how much fun that was. In Chur we transferred to the smaller Albula Railway section operated by Rhaetian Railway (Rhätische Bahn in German or RhB). This is a UNESCO World Heritage train line. 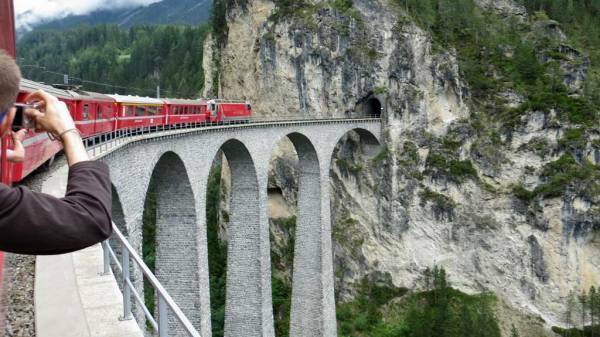 It runs through steep gorges, up switchbacks, through spiral tunnels inside mountains and over fabulous bridges such as the Landwasser Viaduct. We were on the local train with almost no one on board. You could easily switch to the opposite side of the train to catch the views and then switch back again. The best part was that you could push down the windows and take clear pictures outside the train. They even had broom bristles suspended on the tracks to slap your hands back inside just before you might come in contact with a dangerous tunnel abutment or concrete post. We found this section fascinating. We were glad we took the extra effort to go all the way to St Moritz instead of catching the Glacier Express at Chur for the ride to Zermatt. This way we saw the most exciting section twice instead of missing it altogether. We spent the short evening hours wandering the streets of St Moritz in the rain. We stayed at Hotel Arte and picked a Japanese style room, which turned out to be a mistake as all the seating was on the floor, so the novelty of the design wore off quickly. The very next morning we caught the Glacier Express heading back the other way over the Landwasser Viaduct and on from Chur to Zermatt. 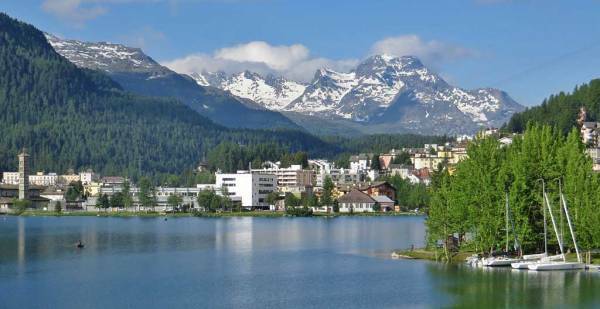 I’d have to say the 7.5 hour Glacier Express train was a disappointment after riding the local line to St Moritz. Granted the observation cars have much more viewing area, the seats are better and there is food service. However the windows don’t open, so all the photographs we took were marred by internal reflections and it was much hotter than the local line. 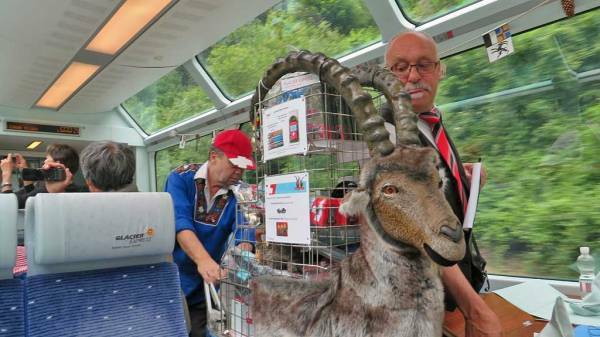 The Glacier Express was crowded, so you couldn’t wander from side to side to catch the views. Also the assigned seats face each other on the Glacier Express, so one of you rides backward the entire time. If I had it to do over again, I would ride the local lines on the Rhaetian Railway and the Matterhorn Gotthard Bahn instead. I had the pleasure of visiting Zermatt for the first time in June of 2015. We arrived June 17th on the Glacier Express. The ascent up the valley to the town was picturesque. The Swiss cog trains are remarkable. We stayed two nights at the Christiania and this hotel was great. We paid for the upgrade to a room with a sitting area and a balcony that faced directly on to the Matterhorn. Luckily it was out in full view that evening and I sat mesmerized watching it for a long time. At dusk we wandered the streets of Zermatt, which only allow commercial electric vehicles and no private ones. We checked out the mountaineers’ cemeteries at the English and the Catholic churches. 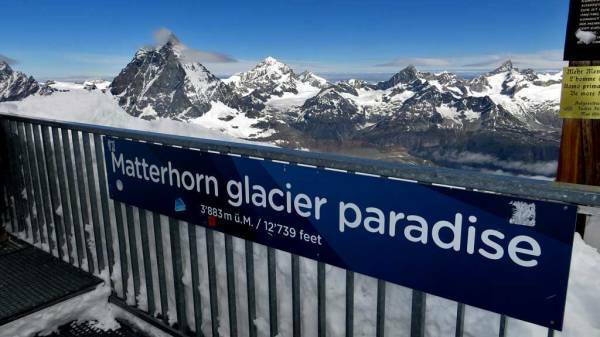 Over 400 people have died climbing the Matterhorn. In the morning I planned to do the Gornergrat cog train and then the gondola to the Matterhorn GlacierParadise, but it was rainy and foggy, so we had a leisurely breakfast at the hotel. Around 10am the clouds began to break up and we opted for the gondola at the other end of the small town of Zermatt. You can take an electric bus, an electric cab or walk for 20 minutes to get there. In summer there are 3 separate gondolas that lead in a series to the summit of the Klein (Little) Matterhorn at over 12,000 feet. At the end of the second one, skiers were heading off to a separate lift. It was expensive to ride the 3 gondolas, which is typical of Switzerland. Even with half off for having a Swiss Travel Pass for rail, it was 50 Swiss francs per person ($53 US). On the way up, the clouds began to break up and blue skies pushed in from the north. I took way too many pictures. 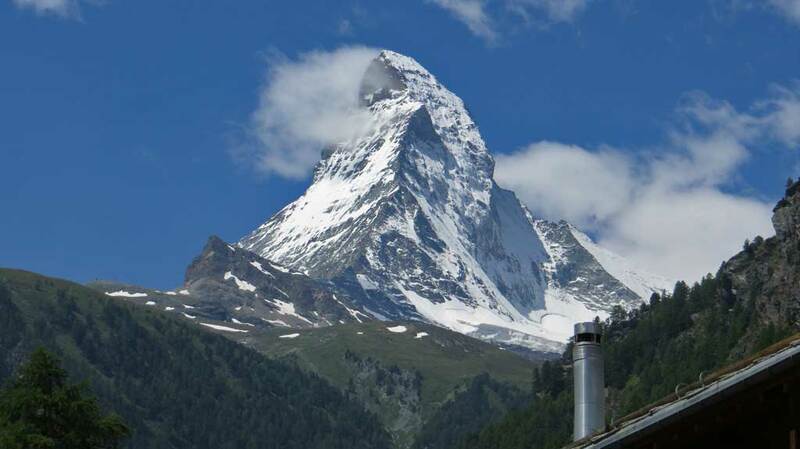 The Matterhorn looks like a pyramid from this vantage point. We had a great view of numerous peaks, including Mont Blanc in France. The final station of the Gornergrat cog train was visible and it didn’t look to be as interesting an option since it’s located lower down and not as close to the Matterhorn. I was glad we chose the gondola. When we finally headed back down to Zermatt, the cloud cover began to return and by late afternoon it was raining. 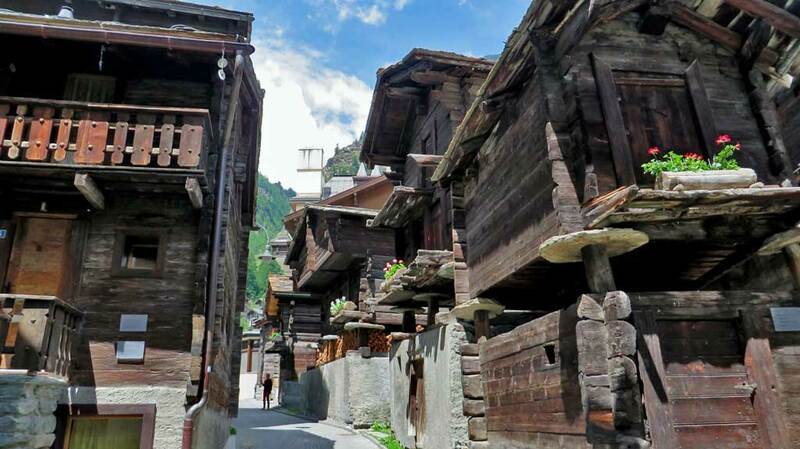 That afternoon we sought out a small section of streets in the old town Swiss village of Zermatt. The homes were made of very old looking wood. They were set on wooden stilts capped with round slabs of slate that were traditionally used to prevent mice from climbing in to the home. My visit to Interlaken in June 2015 involved much more rain and cloud than my previous visit in 2010. We arrived from Zermatt by taking the train through the extremely long tunnel that starts at Visp en route Spiez. From there the train travels along Lake Thun to Interlaken West. The Sunny Days B&B was less than a 10 minute walk from the train station. It was cloudy in Interlaken, but not raining as forecasted, so we walked along the river to the Harder Kulm funicular and took the extremely steep 8 minute cog train ride up the hill. The views of Interlaken and the lakes were fabulous. The Jungfrau and the rest of the Alps were peaking out through the heavy clouds higher up. We enjoyed a typically expensive Swiss meal. They weren’t top quality burgers but we enjoyed them immensely. After lunch we descended back to Interlaken and used our Swiss Pass to head to Lauterbrunnen. From there we caught the local bus to Trummelbach Falls. The bus stop was clearly labelled opposite the train station and the fare was covered with by our Swiss Rail Pass. There was an entry fee at Trummbelbach Falls. They weren’t what I expected at all. An elevator takes you over halfway up inside the mountain. From there you climb up to several viewing stations inside the mountain to see the water twisting, turning, swirling and falling. Bring a rain jacket. It’s very wet. Then you retrace your steps down and descend to a number of other viewing stations below the elevator station. Eventually make your way back down on foot all the way to the ticket booth at the entrance. 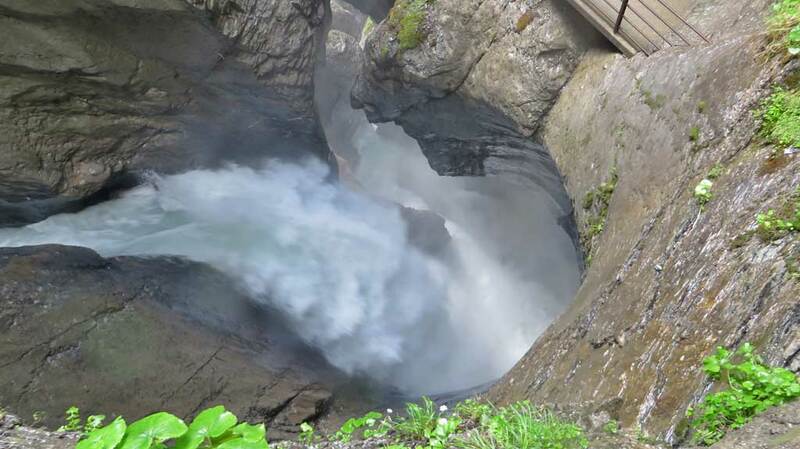 If you aren’t a big fan of caves, I’d recommend skipping Trummelbach Falls. We arrived in Lucerne by train on a cloudy June afternoon. We stayed at the Ibis Budget because it was inexpensive. It’s located about a 15 minute walk south of the train station. The room was very small, but served its purpose nicely. There were travelers from all over the world checking in. 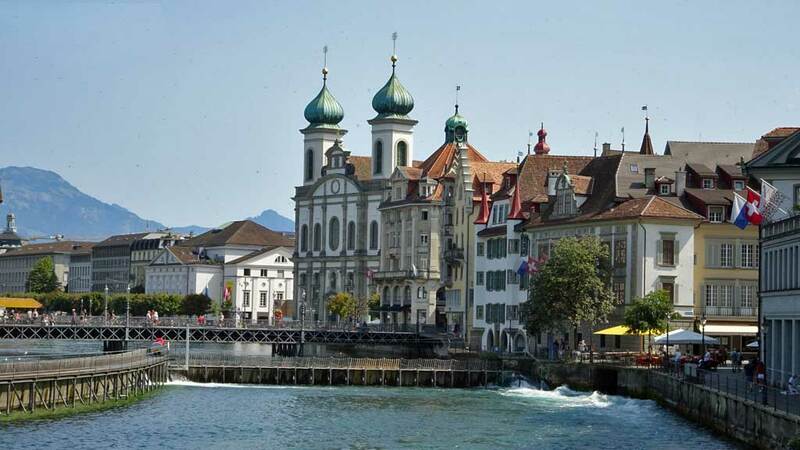 That afternoon we walked back to the station and then walked past the major attractions of Lucerne, including the museum by the station, the Chapel Bridge, the Jesuit Church, City Hall and the Old Quarter. We went up the hillside to the Musegg Wall, which used to defend the city. I was surprised how much of the wall and its towers remain. Tourists can ascend several of the towers and walk along the wall, which was great fun. The next morning, the skies were clear over Mount Pilatus. I’d planned to do the Golden Round Trip which starts with a boat trip on Lake Lucerne to Alpnachstad, but I decided to bolt directly to the mountain on the early train. At Alpnachstad, the cog train ticket booth is right beside the rail station and directly across the highway from the boat dock. For those with a Swiss Pass, it’s half off and you can choose to return on the cog train too, but most people continue down the other side of Mount Pilatus on the gondola to complete the circuit. The grade up the north side of the mountain is amazing. It’s 48% in many sections. There are multiple single car cog trains operating on the line. As we approached a steep, overhanging turn near the top, our train car stalled. The operator swore in German and cranked on the emergency brake. Then he stepped out against the mountain cliff and left us locked in the car, hanging out over the cliff. 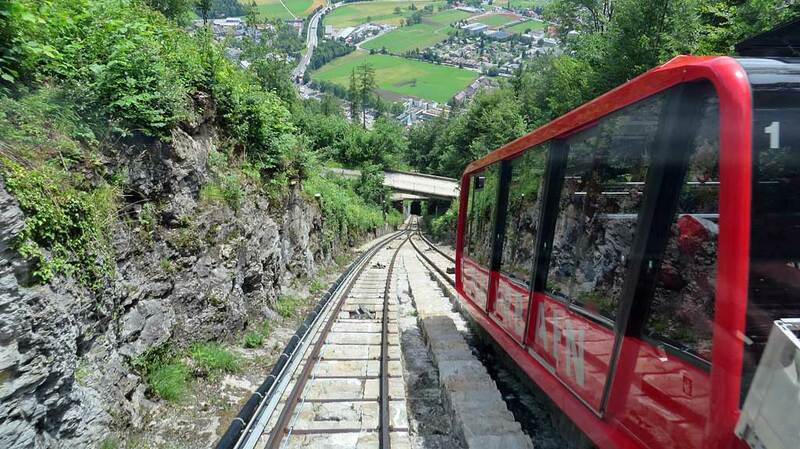 It was a sensation of panic, because I didn’t want to be in the car and I definitely didn’t want to get out and try to walk on the narrow rail line either. After a few minutes of grumbling, the operator got back in, restarted the engine and we completed the ascent. At the top, there were stunning views to the south of the Bernese Oberland, the Eiger and Mount Titlis. To the north, foggy white clouds were encircling us, but there were still excellent views to Lucerne and the foothills. 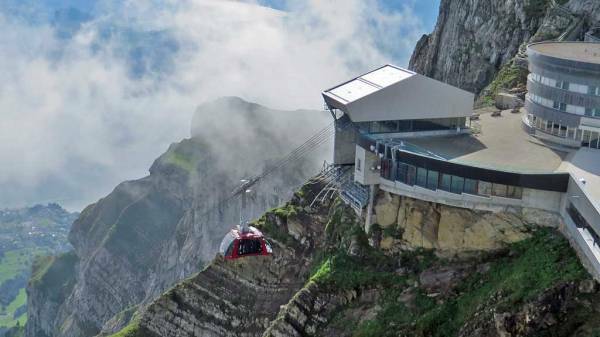 There are many dragon legends at Mount Pilatus. The Dragon Path to the top of the peak was too steep for me to try. From the peak, we took the new gondola, called the Dragon Ride, down the south side of Mount Pilatus to Frakmuntegg, where we transferred to another smaller gondola that took us to Kriens. The walking path from the last gondola station to the #1 Bus stop in Kriens was clearly labelled and quickly took us back to the train station in Lucerne. The bus ride is free if you have a Swiss Pass. The circuit we did is called the Silver Round Trip, whereas the Golden Round Trip involves traveling by boat from Lucerne to Alpnachstad. 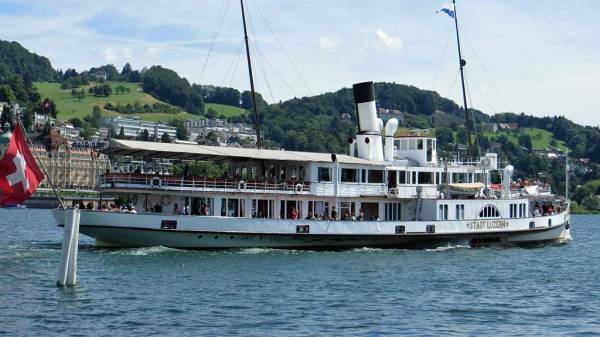 Since we had a Swiss Pass and boats are free with it, we continued on from Lucerne to Alpnachstad again. This time we went by boat instead of by train. We enjoyed lunch on the boat at typical Swiss prices. It was a beautiful ride to Alpnachstad and we enjoyed it so much that we decided to stay on board and return to Lucerne while enjoying an ice cream sundae to top off the day. 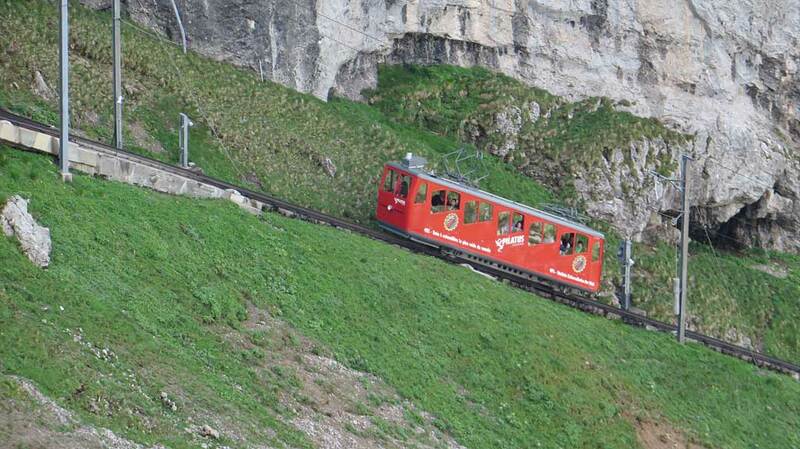 I hear that Mount Rigi and Mount Titlis are great gondola adventures too, but I can’t imagine they can beat the Golden Round Trip Tour of Mount Pilatus. This is a must do for visitors to Lucerne. We concluded our Switzerland Train Trip in Basel. The stations are a challenge there, because Basel is on the border of 3 countries and it has two major train stations close to each other. From Basel, we took a Rhine River Cruise to Amsterdam.